Track lighting was most popular in the 80s, though it is making its comeback with more modern and contemporary looks. It offers a usefulness that is enticing to designers and savvy homeowners. Traditionally used in living rooms, it’s now being installed in kitchens, dining rooms and bedrooms where it’s used indirectly by pointing the light source at shelving units, artwork or display cabinets. While it can also be used for general purpose lighting, there are so many other ways to utilize track lighting. Here are three modern ways to incorporate track lighting into your home! Although track lighting can be used in straight lines, it can also be fun to take a new twist on it! These days, track lighting can easily be shaped into curvy lines. Not only does this feature make it easy for lighting to be incorporated into irregularly proportioned rooms, but it can also add interest to a space. 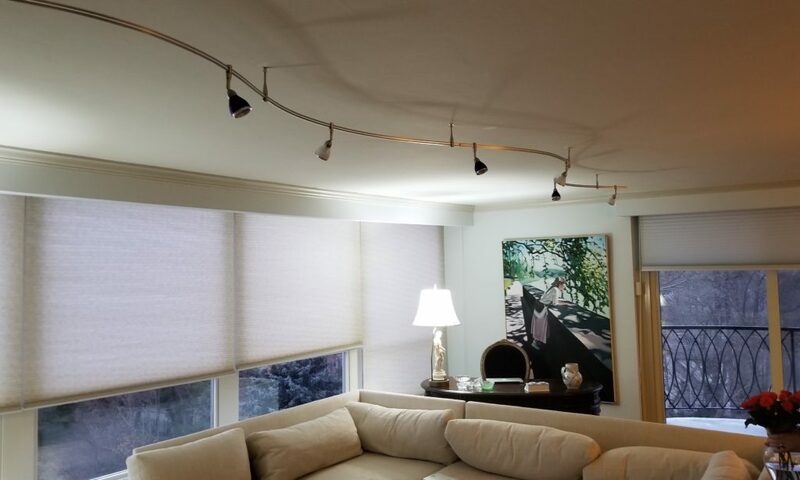 Additionally, if your home has a one-off room that is difficult to evenly light, there’s sure to be a track lighting system that will do the trick. Track lighting is a great way to shed light on an accent wall that you have put time and money into creating. For instance, if you have a wall in your living room that features unique decor, track lighting is the perfect way to enhance it; if you have a brick wall in your kitchen, use it to highlight this special asset; if you have a wall covered in chic plants, a track lighting system will bring it to life. While most people don’t think of this type of lighting system as an obvious choice for bedrooms, if your bedroom has an accent wall—either painted a different color, covered in wallpaper or in a different texture—track lighting will make it look that much more special. When it comes to installing this type of system in a bedroom, just be sure to opt for one that can be dimmed so you can control the brightness of the light. When long, thin hallways are only lit with ceiling mounted light fittings, they can appear to be dark and gloomy. Even if the ceiling mounted light is accompanied by wall mounted lights or a lamp, it still doesn’t make enough of a difference in brightness. Luckily, installing track lighting can transform your dark hallways into the brightly lit hallways of your dreams! Ready to install track lighting into your home? Let the professionals at Farryn Electric install this comeback lighting system into your home to create a modern and unique space. Contact us today!